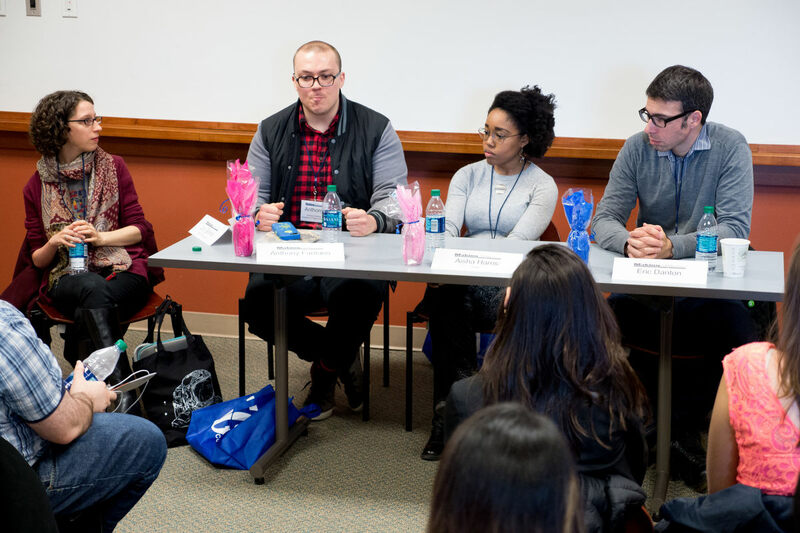 The Journalism Department brought 200 professionals and students to Southern Connecticut State University April 8 and 9 for Making CONNections, a regional journalism conference. The conference featured keynote speaker John Dahl, vice president and executive producer for ESPN Films and Original Content, in photo at top. More than 20 professional development workshops gave insights into topics ranging from drones to ethics to different news beats. 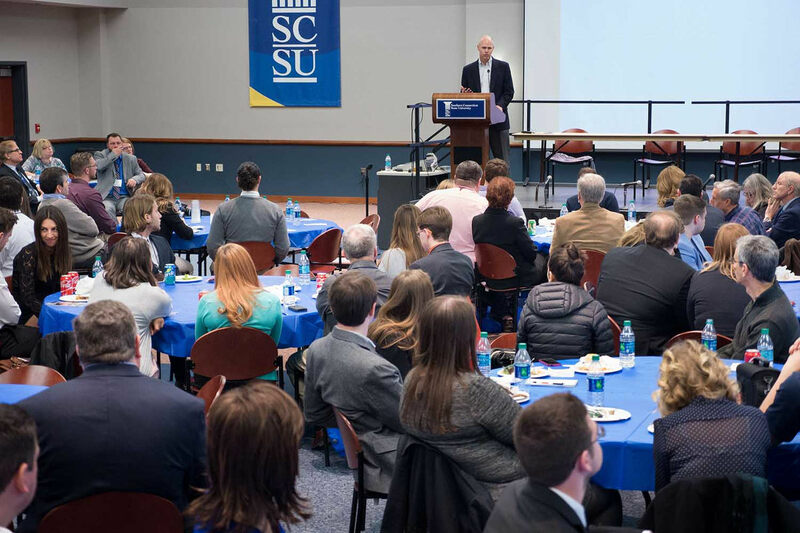 The conference was co-sponsored by the SCSU SPJ chapter and the Connecticut Pro Chapter of the Society of Professional Journalists. Lucy Gellman, Anthony Fantano creator of The Needle Drop, Aisha Harris a staff writer for Slate and Eric Danton former Hartford Courant rock critic during a panel session, Saturday April 9, at “Making CONNections” a Regional Journalism Conference at Southern Connecticut State University. Speakers represented major media outlets, including ESPN Films, Hartford Courant, Newsday, New York Law Journal, Connecticut Health Investigative Team and Slate. Also present were leaders of journalism groups such as the Freedom of Information Commission, the Tully Center for Free Speech and the national Society of Professional Journalists. Leonard Boyle, the deputy chief state’s attorney for Connecticut, and Scott Burrell, the men’s basketball coach at Southern, also appeared on panels. The conference attracted journalists and students from New England and the tri-state area. One student traveled from Cairo, Egypt to New Haven to receive an award in the Mark of Excellence student journalism contest Saturday. 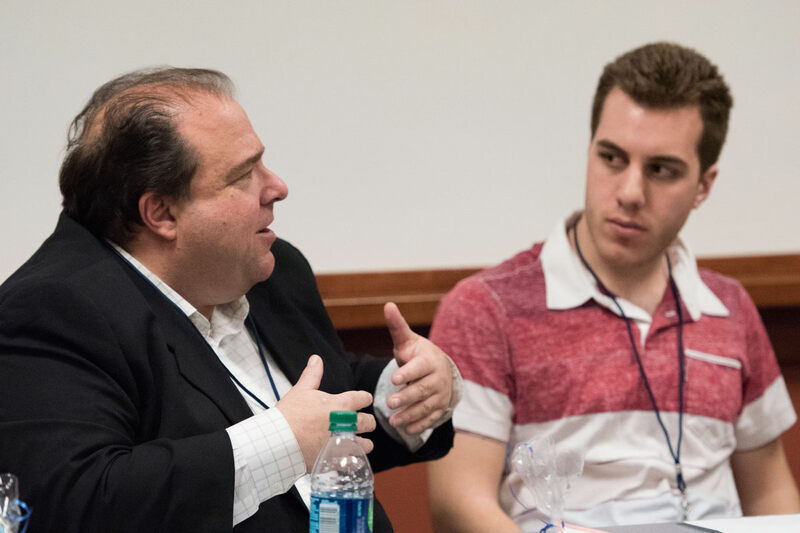 Dom Amore, a Hartford Courant reporter, and Dan Zumpano, the sports director for WSIN radio during a Friday April 8, panel session at “Making CONNections” a Regional Journalism Conference at Southern. Students in the SCSU SPJ chapter organized two of the panel discussions. One focused on how to work with college coaches and sports information directors when covering college sports; The other covered free speech issues on college campuses. 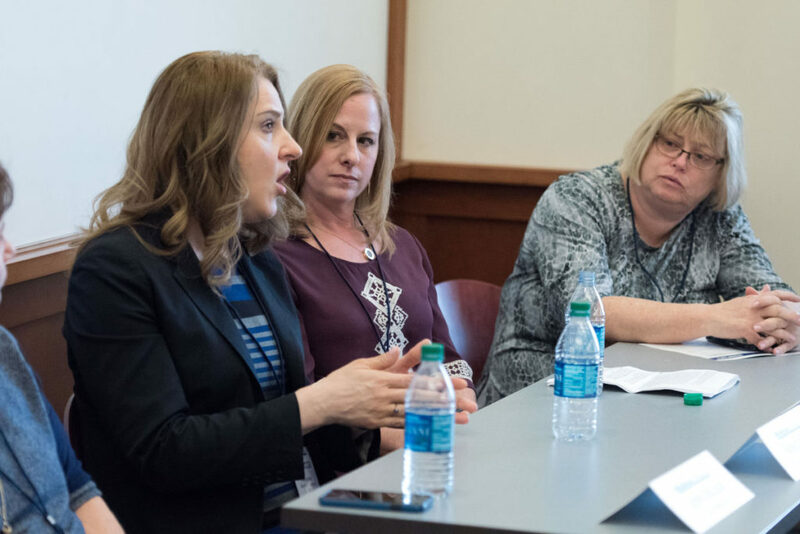 Faculty members and adjunct instructors in the Journalism Department moderated several of the workshops, and Southern alumni were part of four of the panels. Rebecca Baker, national SPJ secretary-treasurer speaks during a panel session, Saturday April 9, at “Making CONNections” a Regional Journalism Conference at Southern Connecticut State University. The conference attracted media coverage in the New Haven Register, the CTNewsJunkie and on CT-N.
All photos by Vern Williams.